In recognition of today’s anniversary, this week Manchester University Press releases the first book on the 1926 British General Strike volunteers. 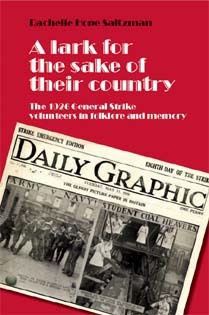 A path-breaking title it tells the stories of the upper and middle-class ‘volunteers’ in the strike. With behaviour derived from their play traditions – the larks, rags, fancy dress parties, and treasure hunts that prevailed at universities and country houses – the volunteers transformed a potential workers’ revolution into a festive public display of Englishness. Saltzman recreates the cultural context for the volunteers’ actions to explore how volunteers, strikers, and the Government used the strike to define national identity; it also considers how and why scholars, novelists, playwrights, diarists, museum curators, local examine historians, and even a theme restaurant have continued to recycle the event. Using the methodology and theory of folklore, social anthropology, literary criticism, and social history, this study presents a cultural ethnography of one of modern British history’s most significant events. From 1985-87, the author conducted correspondence and interviews with nearly 300 volunteers, strikers, and contemporary observers, research that is now impossible to replicate. Those materials, combined with archival documents and a survey of contemporary media along with novels, diaries, plays, memoirs, histories, and exhibitions, provided the basis for exploring the traditional expressive culture of the British upper classes. This book will appeal to aficionados of British social and cultural history, folklore, and popular culture as well as to undergraduate and graduate classes in British studies, modern labour history, and social anthropology as well as those on collective memory, history making and identity. ‘This book tells the story of the volunteers of 1926. It pays particular attention to the ways in which the traditional play behavior of middle, upper-middle, and upper-class men and women influenced their actions—and how others interpreted those actions. While dismissed at the time and since as a joke, the volunteers’ efforts represented serious attempts to assert their right to define Englishness’. Category: Cultural Studies, Politics	19 Comments.